In the prior update, I attempted to utilize the same power I have to make it rain after I wash my car, by going tongue-in-cheek overboard on the SPX chart about the bear case being darn-near silly. (I'm only half joking here.) Sometimes this works, and I've often noted previously that one way for me to do my part (however small) in creating reversals is to spend time charting an alternate count that goes against whatever count I'm favoring -- and the market will often reverse into my preferred count on that very session. 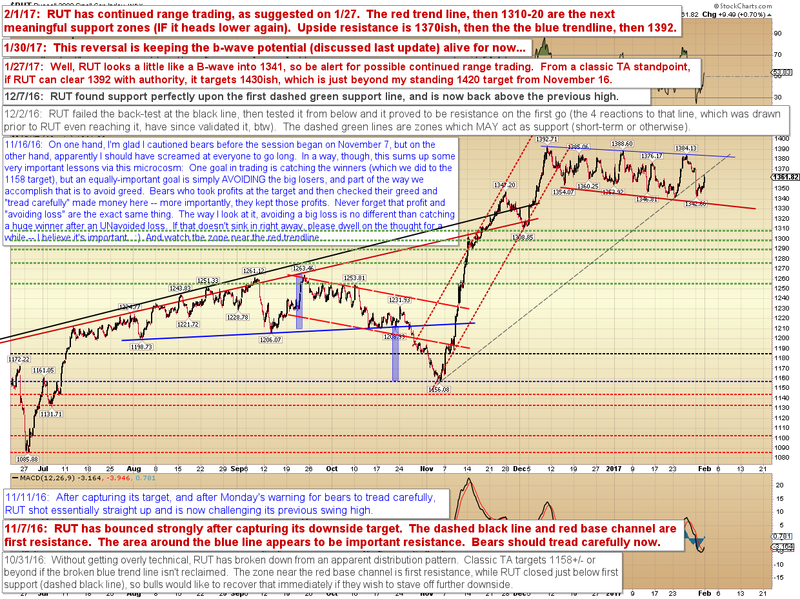 So we'll see if this attempt to goad the market worked, although the noted red trend line is still holding. Despite that, though, the decline from 2300 does appear reasonably impulsive -- so if they're trying to bait bears again, then they're doing a darn convincing job of making it look like there will be at least one more leg down over the near-term. Normally, we'd expect that leg to be of equal or greater length as the decline from 2300 to 2267 -- and in this case, if we do get another leg down, it isn't too hard to imagine it reaching at least 2233. 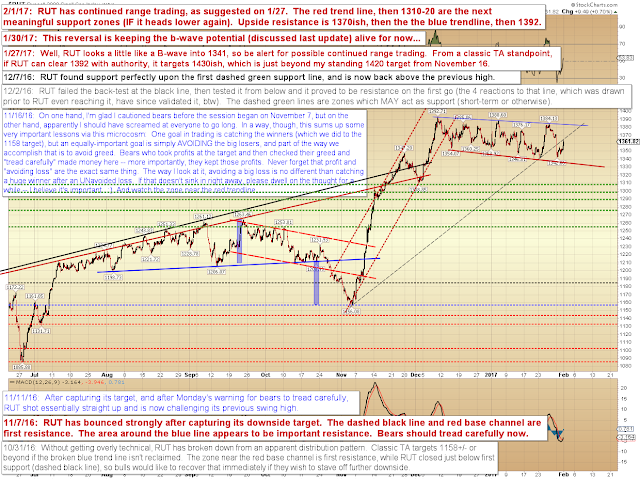 RUT did indeed continue within its trading range, as suggested on January 27. 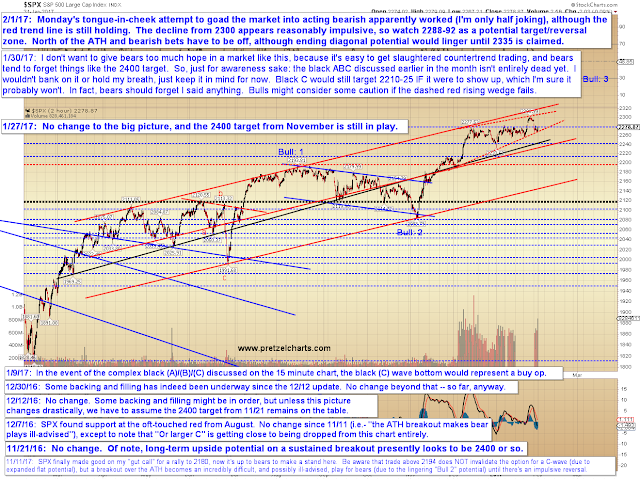 The next downside support levels beyond the range, and the upside resistance levels, are both noted. In conclusion, in most markets, I would say we have an impulsive decline, and thus expect (at least) one more leg down after the current bounce completes. In this market, who knows. Maybe tomorrow Trump will announce that the United States is going to build a wall around China, and the market will rally in anticipation of massive job creation... at least until somebody realizes that China already HAS a wall, which lots of people still think is "great," as evidenced by its name ("The Stupendous Wall of China"). Either way, watch 2288-92 and the zone near the all-time high for potential reversals. If SPX instead powers straight through the all-time high, then of course we had another bear trap, and bears will have to go back into watch and wait mode. Trade safe.